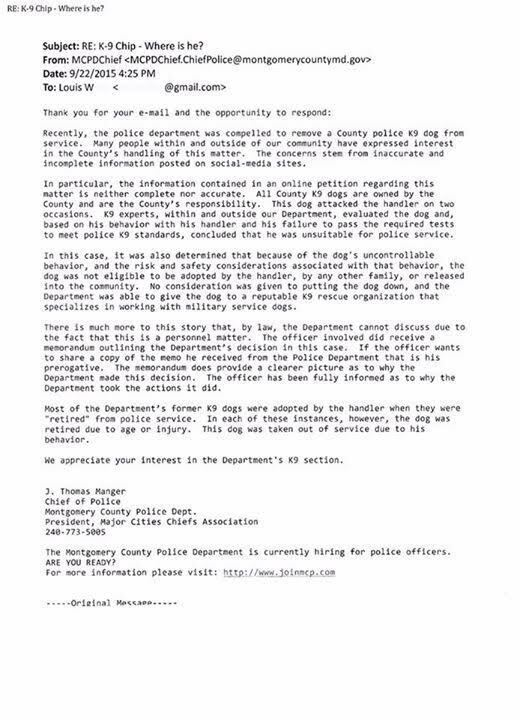 Maryland Police Lie to K9 Handler, Abduct and Hide Police Dog in the Name of “Safety”. Anyone who follows police accountability issues knows that the police are authorized to – and indeed often do – lie in the performance of their duties. Ostensibly, this is to trick the suspected criminal into divulging something that will help officers build their case, but it’s always interesting when this prevarication is turned inward. We don’t know what’s causing Maryland police lie to each other today. But it’s spawned an online and very public “blue on blue” petition for justice for a retired officer. Officer Gil Fones of the Montgomery County Police Department has handled K9 officers for two decades during his 27 years of service. Chip, the officer’s most recent partner – a Belgian Malinois – was recently taken from him abruptly and without explanation. Originally, department leadership had informed Fones that Chip was being retired, but that the officer would have the option to adopt him, consistent with how they’d handled such occurrences in the past. Then, after they’d taken the dog and kept him in a kennel for several weeks, they quickly changed their story, saying that they were going to euthanize Chip or move him to an undisclosed location. The reason they gave was that Chip had bitten his handler during a recertification exercise in April 2015. Montgomery County publishes numerous photos of their K9 officers with their partner cops, and of their officers efforts towards the canine community onto their official Facebook page. Clearly, their department shows concern for canine life, but it’s unclear why they’re suddenly separating Chip the K9 service dog from the person and his family with whom he’d bonded. Chip worked with Officer Fones for over four years. In addition to working with the dog while on patrol, the Fones family looked at Chip as a member of their household. The sudden departure of one of the family pets has left Gil, his wife, and their children reeling, and the changing narrative from his superiors has caused several retired officers to start a petition and a Facebook page demanding answers. We frequently see references to the “thin blue line,” the idea that police officers are willing to go to great ends to protect their own, even in cases where misconduct has been alleged. Why then does Montgomery County police chief Thomas Manger refuse to provide information about what actually happened to Chip, or where he’s currently located? The publicly provided reason is that Chip was retired “due to his behavior,” but Manger won’t say exactly what that means. Hiding behind the excuse of “personnel issues” holds less weight when one is talking about an animal. In typical cop fashion, the Manger has also claimed that the published information doesn’t tell the entire story. While this may or may not be true, his response is dubious given that we’ve seen instances where the same excuse is used in the face of overwhelming evidence of wrongdoing. It’s also suspect that “safety” was the reason given for forcibly removing Chip from his home. 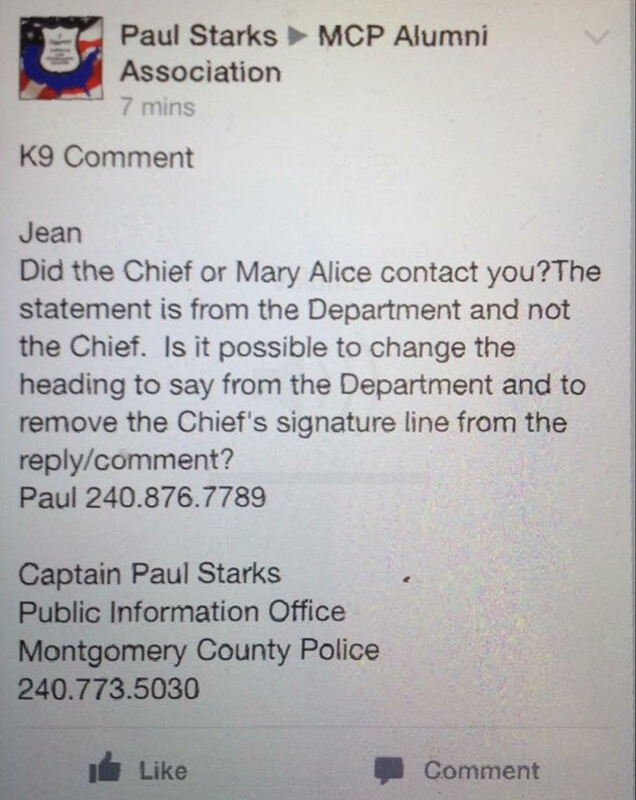 The Montgomery County Police Department has since tried to walk back the chief’s written statement, telling you that something is amiss. In fact, they’re falling over themselves trying to come up with believable excuses for a community seeking answers. If Chip was so dangerous, why did they allow him to continue to work for 5 weeks, and more importantly go home each night to stay with the Fones family? Something about this story doesn’t add up. More importantly, K9 officers are in fact service animals whose true service is rendered to the public. No mere pet, these K9 officers deserve special treatment, not trips through the Police PR Spin Machine, then separation from their families in retirement. Chief Manger can be reached at 240-773-5005.